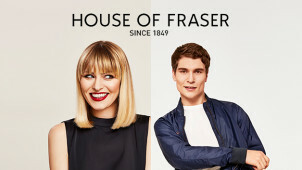 Free £5 Voucher with Click & Collect Orders at House of Fraser Take advantage of this terrific offer at House of Fraser, and enjoy a free £5 voucher with your click & collect order. Wedding Dresses from £85 at House of Fraser Your dream dress doesn't have to cost the earth. Find an elegant wedding gown at House of Fraser from only £85. Find Up to 70% Off Swimwear, Beachwear and Accessories in the Holiday Shop at House of Fraser Up to 70% off Women's swimwear, sandles and summer dresses in the House of Fraser Sale. Get Up to 50% Off Dresses at House Of Fraser Freshen thing up at House of Fraser this spring, hurry and bag a brilliant deal on the perfect party dress! Save £30 Off Jewellery and Accessories at House of Fraser Add some sparkle to your wardrobe with House of Fraser. Discover 60% Off Women's Skirts at House of Fraser Save a bundle on your order, and freshen your wardrobe up at House of Fraser. Get 75% Off Kid's Clothing, Toys and Nursery at House of Fraser Find everything for your little one at fantastic prices. Women's New Arrivals from £7 at House of Fraser Get a new wardrobe for far less when you shop at House of Fraser and the new arrivals from just £7. Enjoy Up to 75% Off Women's Knitwear at House of Fraser With up to 75% off orders, it is the perfect time to stock up on knitwear for the cold weather at House of Fraser. Home Delivery from Only £4.99 at House of Fraser Enjoy a range of delivery options to suit you at House of Fraser. Enjoy 50% Off Home and Furniture at House of Fraser Check out the mid-season sale at House of Fraser, and save big on your home improvement. When it comes to a quality retail experience, House of Fraser have it all. With over 150 years in the world of luxury living, they know how to please shoppers who are looking for high-quality fashion from premium brands. Their selection of fashion concessions struts the fine line between designer and contemporary fashion, offering you a sumptuous selection of casual, high fashion and eveningwear brands, ready to prepare you for any occasion; from weekend breaks in the countryside to black-tie dos! It's not all about designer fashion; shop for stunning gifts, beauty essentials, beautiful homewares and sleek electricals too! House of Fraser is a department store for purveyors of style who love to shop for the latest from popular brands, all under one roof. Why not brighten up your mornings with a new coffee machine? You'll soon wonder how you made it out the house each morning without it. Or if your greatest pleasure is flopping into bed at the end of the day, shop the range of quality bed linen to create your dream retreat. So what are you waiting for? Visit them online or in-store, a steal a little House of Fraser fashion credit for yourself. How do I use my House of Fraser discount code? Click ‘Checkout Securely’ to continue with the payment process and enjoy your savings. Sign up for a Recognition Rewards Card to collect points to spend in-store and enjoy the perks of being a valued House of Fraser customer. What does House of Fraser sell? House of Fraser aren’t just exclusively committed to fashion. They have a broad range of departments with shelves decorated with premium brands ready to bolster your style in every aspect of life. Shop for womenswear, menswear, childrenswear, footwear, handbags and luggage, beauty, children's toys, home and garden, furniture and electricals which have earned the HoF stamp of approval. What are the House of Fraser delivery options? No matter your needs, House of Fraser ensure that your order arrives when you need it, at a reasonable price. Choose from one of the following delivery options for shipping times to suit everyone. Where can I buy a House of Fraser gift card? You can buy a House of Fraser gift card on their online store here, in a variety of different designs to suit the lucky person you’ve got in mind. You can even add a smart gift box to commemorate the occasion. Will the House of Fraser Black Friday sale start early? There’s only one way to find out, and that’s by staying in touch with us. After all, we love it when Cyber Weekend comes around, and when you’re looking for a House of Fraser Black Friday deal on clothing, homewares, beauty products and more, you’re sure to beat the crowds online with us. Collect+ Delivery- £3.50 order by 7pm. Apex Building, Northfield, Milton Keynes, MK15 0DB. House of Fraser is the UK’s leading department store with 160 years of history on the high street. If you take style seriously, the deluxe range of designer and heritage brands at House of Fraser for men, women and kids of course, will do wonders for your summer wardrobe. Break free of budget limitations with a House of Fraser discount code and find that sophisticated new look, toaster or tv that you want to make an impression. A great bet for birthdays, anniversaries, or to yourself just because, you'll find something to make you feel brand new again at House of Fraser. Shopping is hard work, so House of Fraser have a bookable in-house personal stylist service to help you find new season pieces that work together to create a killer outfit for the season. This is your wardrobe's summer refresh sorted. Step into gorgeous dresses, brimming with feminine, floral features and sharp detailing, while men can find chinos galore and printed shirts to put a spring in their step too. Forget looking standard with a House of Fraser personal stylist on your side! The sophisticated selection of handbags and manbags at House of Fraser is bound to catch the eye of chic shoppers looking for a fresh piece of arm candy this year! Refresh your wardrobe without splashing the cash when you use a House of Fraser voucher code online and find a statement bag worth flaunting. If you’re wise to the style power of a premium accessory, treat yourself this year with a luxury bag from the HoF selection of brands.